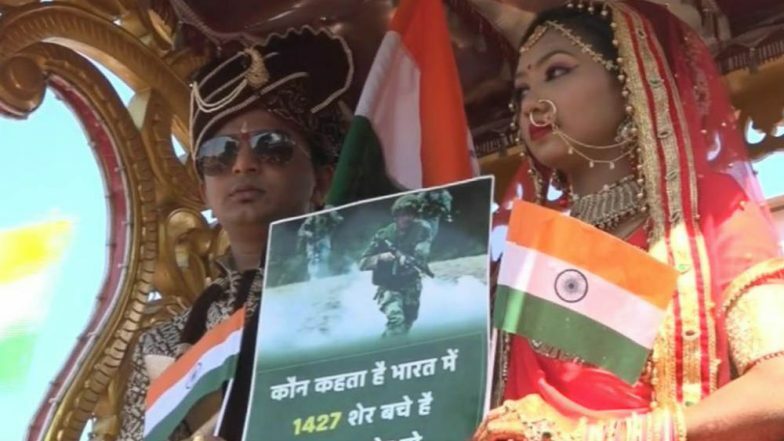 Vadodara, February 17: Expressing condolences and solidarity, a couple in Vadodara on Sunday dedicated their marriage procession to the brave soldiers who gave up their life for the nation in the Pulwama attack. The duo took out a procession on Vadodara streets to pay tribute to the Central Reserve Police Force (CRPF) personnel who lost their lives in the ghastly terror attack in Jammu and Kashmir's Pulwama on Thursday. During the procession, the couple was holding a placard that read: "Kaun kehta hai Bharat mai 1427 sher bache hai? 13 lakh sher to border par tenaat hai. (Who says that there are only 1427 lions left in India? 13 lakh lions are standing on the border to serve the nation)". People present in the procession raised anti-Pakistan slogans and demanded strict against the perpetrators. Pulwama Terror Attack: How CRPF Jawans Fell in JeM Trap. Thousands of people, including CRPF officers gathered in Bhopal on Saturday to express solidarity with the families of jawans who were killed in the Pulwama attack on February 14. Showing solidarity with the deceased jawans, Trinamool Congress led by its supremo Mamata Banerjee also took out a candlelight march in the state capital Kolkata. "We express our solidarity with our jawans, countrymen and united India. At this hour, we are all together," West Bengal Chief Minister Mamata Banerjee tweeted earlier on Saturday. At Port Blair and Ladakh, hundreds of people gathered at various places and lighted candles and condemn the cowardly act. "We feel ashamed of being a part of Kashmir that supports terrorist activities. Ladakhis are peace-loving and patriotic people," Ladakh Buddhist Association President Tsewang Thinles said. State Bank of India Enables UPI Bharatkeveer@sbi to Collect Donations for Pulwama Terror Attack Martyrs. A Jaish-e-Mohammad (JeM) terrorist rammed a vehicle carrying over massive explosives into the CPRF convoy on Srinagar-Jammu national highway around 3.15 pm on February 14. Earlier on Saturday, the all-party meeting was called by the Central Government to deliberate upon the situations arising out of Pulwama terror attack. The meeting was chaired by Union Home Minister Rajnath Singh.